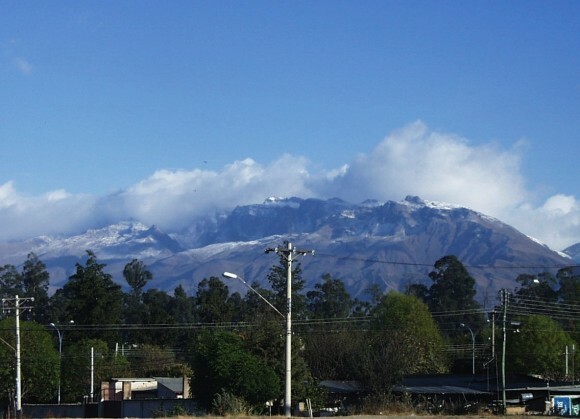 For those who have never had the pleasure of climbing the famous Mt Tunari, at the end of the Cochabamba valley in Bolivia, I thought I would pen a few words to tell of our expedition some years back. The occasion of the adventure was a visit by our eldest son, aka the MK Taler, and friends from Australia. We were joined also by two fit, young missionaries of North American origins—one, Jim, acting as guide and one, John, a hanger-on. One thing I should say at the outset is that Tunari’s height has long been thought to be around 17,250 ft (or 5257.8 metres . . . in real money). This estimate was made, presumably, by an observer standing on the highest point on the road from Cochabamba to Morochata, in the middle of the Cordillera Central mountain range, and what he meant was that he thought the summit was probably about that height above where he was standing. Either that or it was made by a NASA expert who didn’t know the difference between feet and metres. It can happen. Either way, it is much higher than that! I know. I have climbed it! Before we set out from the city I asked Jim if we could walk all the way from Coch to the top. He said that it wouldn’t be a good idea as there were women and children in the group, and he had to work next week but as he turned to get into his jeep he muttered that as far as he was concerned I could walk to La Paz if I wanted to. I was really touched by this . . . our ministry coordinator saying I could have 2 or 3 days off to walk to the capital. Posted in Adventure, Bolivia, Guest WritersTagged Cordillera, TunariBookmark the permalink.